Protect our planet, speak Spanish, share the stoke! Job description: Teach surf lessons (in English),. be the head server during the evening shift (5pm-9pm). Help with sea turtle conservation: release baby sea turtles to the ocean and offer sea turtle conservation tours. Participate in art workshops at the local school (9-11am once a week). 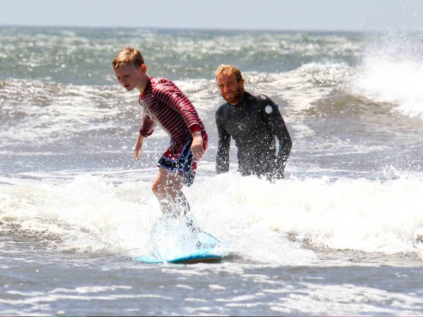 Requirements: We are looking for someone who embraces our values and shares a positive loving spirit, both during surf lessons and while interacting with our guests and staff. Compensation: Room and board, return transfers from Managua and compensation. To apply: please send motivations, resume, photos, scan of your certifications, level of Spanish and English, experience teaching, availability and references to loscardonesecolodge@gmail.com. Job description: Teach one yoga class daily (in English), adapting to guests level and requests. Be the head server during the evening shift (5pm-9pm). Help with sea turtle conservation: release baby sea turtles to the ocean and offer sea turtle conservation tours. Participate in art workshops at the local school (9-11am once a week). Requirements: We are looking for someone who embraces our values and shares a positive loving spirit, both during yoga classes and while interacting with our guests and staff. We are looking for a teacher graduate student to develop a curriculum to structure weekly recreational and English as a Second Language activities that lodge volunteers can carry out at the school on a weekly basis. -Be comfortable driving a motorcycle between the Ecolodge and school (dirt road, 8km). The Lodge is very interested in enabling the intern to obtain academic credits at his/her university, as appropriate. We are looking for a biology graduate student to perform data entry, analysis and report of the year sea turtle monitoring program. -Have experience with data analysis and pivot tables. To apply: please send motivations, resume, photos, scan of your certifications, level of Spanish and English, experience with data analysis, availability and references to loscardonesecolodge@gmail.com.